The Géode cinema will close from November 30th until 2020 to be able to offer you an even better experience than what it can already do. This cinema, complete with a giant hemispheric screen, was opened in May 1985 and totally renovated in 1998. 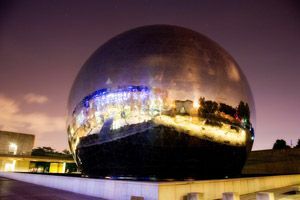 It takes up the upper part of this spherical building measuring 36 m in diameter. The screen, one of the largest in the world, covers almost the entire cinema and stretches over 1,000 m2. The cinema is tilted at an angle of 27° in relation to the horizon and the screen is at an angle of 30°. This position gives the viewer the impression that he is right at the very center of the image. When leaving the cinema, the visitor passes in front of the spectacular projection booth completely made of glass. One can see the film projector on tracks, the niche where the camera is placed during the screening, the reels of films and the horizontal system of unwinding including the sound system racks. The Omnimax system gives an optical illusion effect to the movie and relies on sophisticated projectors which are far above the normal standard projection system. The image projected onto the screen is 10 times larger than the conventional 35mm frame. It greatly exceeds the maximal field of binocular vision of the human eye which is 120° horizontal and 104° vertical. A custom-designed 21,000 watt surround sound system produces audio to match the intensity of the visual images. The audiovisual effects of the movie are computer-managed. 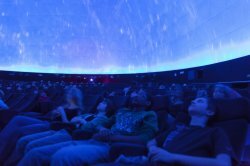 Since March 7th, and while preserving its splendid IMAX system, la Géode now boasts a Géode digital projection system giving access to three new dimensions: Géode 3D-relief, Géode HD: documentaries, short and long feature-length films, High Definition animated movies, Géode shows "live" or via satellite. From Tuesday to Sunday: from 10.30 a.m. to 8 p.m.